Posted 6/25/2017 2:13pm by Sam Bellamy. We are heading into the fourth of July holiday time! For many it means family gatherings or getting together with friends and yes maybe seeing some fireworks. Hopefully we can revisit some of what it took to have freedom and independence. The blueberry fields will be open Monday, 8 to 10:30. I anticipate having the fields open several days this week and especially on Saturday morning. So please stay informed via website or by calling 843-399-6902 or 910 287-9467. Watermelons, corn, tomatoes are looking good and taste even better! If you have a reason for making the 4th have a flair I recommend trying a red white and blue potato salad. We should have the potatoes for that! It is a good thing to do to create fun and memories with kids and grandkids as they can reflect on the meaning of this holiday. 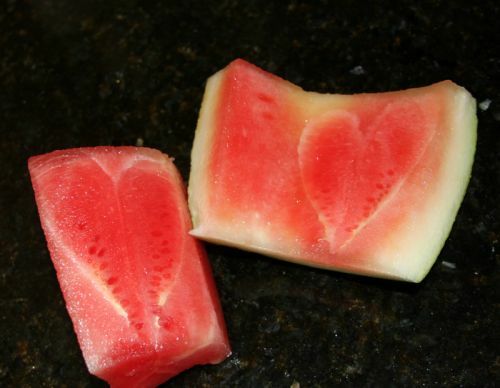 A good watermelon has to have a good HEART ! Posted 6/20/2017 2:56pm by Sam Bellamy. The blueberry fields will be open Wednesday morning 8 to 10. We are getting some very nice corn right now. The watermelons have been good and the peaches have been excellent. They are semi-free and delicious. Blackberries, tomatoes and more are available. Posted 6/16/2017 12:15pm by Sam Bellamy. The blueberry field will be open from 8 am to 9 am Saturday. This is the first day of PYO. We need to keep it short i order to not over pick. The price is 2.50/pound. Posted 6/7/2017 8:06am by Sam Bellamy. We are picking blueberries for the market. PYO will be most likely closer to mid June which is the normal time for opening the fields. The berries are very nice but due to the late March freeze we lost a lot of the early fruit. The later varieties look good. At the markets ( here at the farm and Myrtle's market on Joe White Ave. ) we have very good yellow squash, different types of zucchini, lots of pickling cucumbers, beans ( string, October beans, burgundy beans ), cabbage, radishes, kale, chard, turnips ( purple top and white). We are picking some blackberries but they are going extremely fast. We are bringing in good watermelons, corn, tomatoes and peaches. The peach crop was severely damaged by the late March freeze so we are glad to have peaches of this quality. They are cling but with excellent flavor. We have HONEY from the farm as well as our backup source. 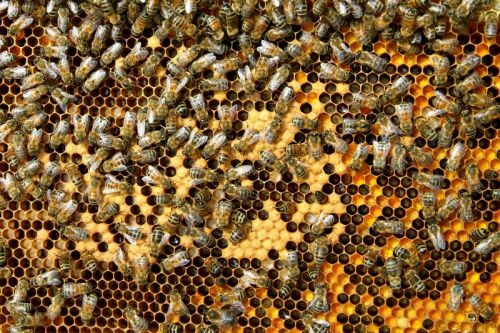 the honey flow was shorter than anticipated this year so again we are thankful to have a good supply of honey. Posted 5/25/2017 10:33am by Sam Bellamy. Time , what an amazing reality! It has many facets and timing is one of them that is integral to farming and many other aspects of life. Well to get to the point, it is the time for certain vegetables. They are at their best. Tender yellow squash, zucchini and pickling cucumbers are abounding here on the farm. The organic field has excelled beyond any crop I've seen either conventional or organic in many years. It is a great time to get vegetables the way you like them. We have different kinds of zucchini, some ideal for stuffing. Remember you can prepare stuffed zucchini and freeze it for later. Too many times I have known people to want pickling cukes after the season peak has past. Now is the time. You don't want to wait. Those pickles will make a great Christmas present or some pleasant times this winter. You may want to do cucumbers now because later you will be freer to do watermelon rind pickles when the watermelons reach their peak. Time! Enjoy it use it wisely and lovingly. Posted 5/18/2017 9:29pm by Sam Bellamy. If you have not tried the yellow squash or zucchini don't wait too long . It is at its prime. I ate squash casserole tonight with string beans. It was truly good. The cucumbers are chasing the squash to see who can outdo each other. The pickles are gaining momentum and have to be picked almost daily. So fresh is in these days. Sarah will have with her Magda zucchini and golden zucchini. The first of the organic beans will be be with her as well. green string beans, purple beans, yellow wax beans and red swan beans ( a new variety). Dill, dandelion, parsley, cilantro, basil ( limited for this week). A few mushrooms, lettuce, kohlrabi, cabbage, radishes, mustard and more. The cantaloupes have been good also. Posted 5/13/2017 8:26am by Sam Bellamy. In the midst of trying times it is special to be reminded of the essence of what life is truly about. People certainly rate up there and moms have their own special seat at the table. We encourage you to make an effort to give your best to the people who matter so much in your life. If we can help we have a good supply of good strawberries, some excellent organic squash and zucchini, kohlrabi and more. This week should begin picking cucumbers and some beans. Freshness is getting fresher! Posted 4/19/2017 9:05am by Sam Bellamy. We will be both at Myrtles Market and the farm market here at the farm on Friday and Saturday. Some of the vegetables from the farm look very good. We are picking strawberries from our smaller field even though we don't have enough for PYO. We have several typed of kale, lettuce, greens, kohlrabi, poc choi , chard. Hope to see you. Posted 4/7/2017 7:28pm by Sam Bellamy. Posted 3/29/2017 7:33pm by Sam Bellamy.